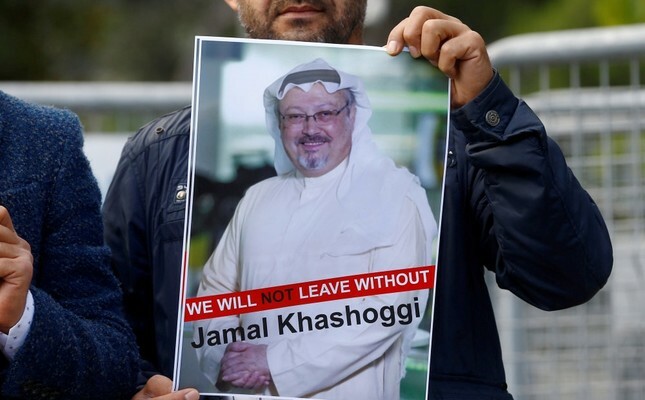 A demonstrator holds a picture of Saudi journalist Jamal Khashoggi during a protest in front of Saudi Arabia's Consulate in Istanbul, Oct. 5, 2018. The U.S.' unwillingness to put pressure on Riyadh for the killing of dissident Saudi journalist Jamal Khashoggi has only created maneuvering room for Saudi Arabia to stall an investigation, despite Turkey's efforts to shed light on the matter. The White House's refusal to disclose the names behind Khashoggi's murder and failure to provide Congress a detailed report linking the Saudi royal family to Khashoggi's murder at the end of the 120-day period provided by the Global Magnitsky Act, is only providing leverage to Saudi Arabia in covering up the killing in the hope that the outcry will die out. In response to mounting pressure from U.S. lawmakers, U.S. Secretary of State Mike Pompeo said on Monday that Washington "is not covering up for the murder." "America has taken more action in response to the tragic murder of Khashoggi and will continue to take more action; [we] continue our investigation. We are working diligently on that. The president has been very clear, couldn't be more clear, as we get additional information, we will continue to hold all of those responsible accountable," he said. "This amounts to the [U.S. President Donald] Trump administration aiding in the cover-up of a murder. America should never descend to this level of moral bankruptcy," said Sen. Tim Kaine, in a statement on Sunday regarding the U.S.' indifference over the case. Khashoggi was killed in the kingdom's Istanbul consulate on Oct. 2 by a team of 15 people consisting of Saudi officials who arrived in Turkey for his murder and a cover-up operation, including dismembering Khashoggi's body. After offering numerous contradictory explanations, Riyadh later said Khashoggi had been killed and his body dismembered when negotiations to persuade him to return to Saudi Arabia failed, but denied any involvement of the royal family. The incident was blamed on lower-level officials, detaining some of the suspects and seeking the death penalty for five. However, many wonder what other additional information is needed to convince the administration that persistently declines to believe its own intelligence agency report, which stated with high-confidence the Crown Prince Mohammed bin Salman (MBS) of "personally targeting" Khashoggi and "probably ordering his death." Various senators and pundits regard the U.S. as turning a blind eye to the apparent evidence for the sake of not endangering its expensive arms sale to the kingdom. As Republican Sen. Lindsey Graham, a well-known Trump ally, previously put into words, "inaction wouldn't only give the disturbing impression the U.S. has a price, but also that its price is quite low." Echoes of Washington's idle stance are also being observed in other parts of the world. Motivated by the lack of no repercussions for the murder, Saudi Foreign Affairs Minister Adel al-Jubeir told CBS News on Sunday that Riyadh does not know the location of Khashoggi's body, despite having detained the Saudi team that murdered him. Questioned on why the suspects could not say where the body was, al-Jubeir said, "It is an ongoing investigation and they will eventually find the truth." Citing Saudi officials, The Wall Street Journal also alleged on Monday that Saud al-Qahtani, who was sacked as adviser to the crown prince after being accused of playing a role in the murder, continues to unofficially serve as an adviser. "We don't see that Saud al-Qahtani is very constrained in his activities," one State Department official was quoted as saying. In December 2018, a Turkish court also issued arrest warrants for al-Qahtani, believing there was strong suspicion that he was among the planners of the murder. On Thursday, The New York Times also reported another sign that Riyadh does not really care about "finding the truth." The paper wrote that Saudi Arabia on Sunday appointed former media chief Turki Aldakhil as its ambassador to the UAE just days after it was revealed that MBS told him he would "use a bullet" on Khashoggi. Khashoggi's murder prompted unprecedented international outcry and forced many countries to reassess their ties with Riyadh. Western countries including Germany, France and Canada have placed sanctions on nearly 20 Saudi nationals, while the murder has damaged Riyadh's international reputation as the case turned the spotlight on the crown prince. Washington, however, has been unwilling to sanction Saudi Arabia by downplaying the role of the prince as it sees Riyadh as an important ally to contain Iranian power in the region and has maintained that the expensive arm sales to the kingdom should not be imperiled. Determined to ward off any attempts of covering up Khashoggi's murder Ankara yet again underscored on Monday that it will continue its efforts to bring those responsible to justice. "We have said that we will not allow a covering up of the matter. We are not seeing enough and desire cooperation on the issue," Justice and Development Party (AK Party) spokesperson Ömer Çelik said. He added Saudi Arabia's Chief Public Prosecutor Saud al-Mojeb, who came to Turkey as part of the investigation launched in his country, tried to find out how much information Ankara had, instead of cooperating with the Turkish judiciary, confirming Riyadh's efforts to drag its feet on the investigation. In the face of steps from both Saudi Arabia and the U.S., Agnes Callamard, the U.N. special rapporteur on extrajudicial, summary or arbitrary executions launched her own inquiry into the killing in late January. "Evidence collected during my mission to Turkey shows a prima facie case that Mr. Khashoggi was the victim of a brutal and premeditated killing, planned and perpetrated by officials of the State of Saudi Arabia," she later explained, adding that Saudi officials undermined Turkish investigators in conducting an effective examination.